Computer virus is a type of destructive program that can replace itself by making copies of itself without the knowledge of the user.Computer virus is a term given to man-made computer software or system to destroy computer programs or computer. The virus destroys data, useful application, programs, and even the operating system. Computer virus hides themselves in other host files. They are not visible to us. 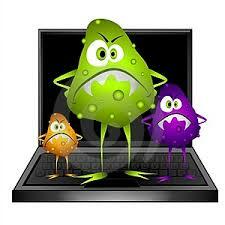 The viruses can corrupt, delete files and programs. Computer Viruses affect the computer in many ways. It can destroy data, files or programs and cause the system malfunction. The destructive effects of viruses are different according to their types. The virus can easily transfer from one file or computer to another. The virus can multiply itself. The virus can hide from users. Macro virus resides inside files. Macro virus is commands which are designed to infect a specific type of document file such as MS-Word or MS-excel support. At present, Microsoft company have designed macro virus protection tools. The examples of such viruses are Melissa, I love you etc. The boot sector virus infects the information system during the start-up process. It tends to create the bad sector of the hard drive or floppy disk. The virus infects the system by using infected diskettes during start up. The entire computer system becomes slow by reading the virus from the disk boot sector. The examples of such viruses are C- Brain, Stone, Disk Killer etc. File infector virus infect application programs. They may attach themselves to any executable file, usually.COM, EXE files. An application program infector takes control after the initial use of the infected program. The example of such viruses is Jerusalem, cascade etc. A polymorphic virus is self- encrypted virus which avoid detection of the scanner. Such viruses actively hide themselves from antiviral software by either masking the size of the file they hide in or temporarily removing itself from the infected file and placing a copy of itself in another location. The examples of such viruses are Phoenix, Evil etc. Multiparty virus is the combination of boot sector virus and program virus. It can infect both application programs and the boot sector of a disk. When the infected program is executed, these viruses infect the boot record. When you boot the computer the next time, the virus starts infecting other program files on the disk. The example of such viruses is Tequila, Flip etc. The speed of computer is reduced. The instruction of program is reduced. Data may be lost in the database. Virus may transfer from one file to another. It corrupts the system data. Computer viruses are very harmful to computer system. They can destroy data and information. So, computer should be protected from viruses. Install anti-virus software from a well known, reputed company and use it regularly. Do backup your entire system on a regular basis. Because some viruses may erase or corrupt files on your hard disk. Do not use any pirated software. Lock the computer system using password to prevent your computer from being used by others. Do not download any programs from the internet unless you are confirmed that they are virus free. Be careful while checking mail having attached documents. Computer virus is a type of destructive program that can replace itself by making copies of itself without the knowledge of user. A computer virus can destroy data, files or programs and cause the system malfunction. Macro viruses are commands which are designed to infect a specific type of document file such as MS-Word or MS-excel support. Boot sector virus infects the information system during the start-up process. File infector virus infect application programs. Polymorphic virus is self- encrypted virus which avoid detection of the scanner. Multiparties virus is the combination of boot sector virus and program virus. Computer virus is a destructive program that disturbs the normal functioning of a computer. It is designed intentionally to harm data, information and programs of the computer. When a virus enters in file or program, it becomes active and performs its destructive tasks. List any four destructive effects of computer viruses. Computer virus can degrade the overall performance of the computer system. Computer virus can change the content of the files and codes of programs. Computer virus can even destroy file allocation table (FAT) of a disk and files becomes inaccessible. Computer virus can delete, steal and destroy data, information and programs. What does Boot Sector virus do? The boot sector virus infects the information system during the start-up process. It tends to create a bad sector of the hard drive or floppy disk. The virus infects the system by using infected diskettes during start up. The entire computer system becomes slow by reading the virus from the disk boot sector. What is computer virus? List its types. Which one of the following is not the example of computer virus? What is man-made computer software or system to destroy computer programs or computer? Which virus infects the information system during the start-up process? Which of the following is not the characteristics of computer virus? >Virus can easily transfer from one file or computer to another. Virus mends the damage files. Which virus infect application programs? _______ is self- encrypted virus which avoid detection of scanner. ________ is the combination of boot sector virus and program virus. How to virus created? Who create it and why? Any Questions on 'Computer Virus '?